"The defenders and others killed inside the Alamo were unceremoniously dumped into a mass grave, causing many spirits to be restless and seek for a better eternal rest in the areas around the Alamo, as well as the Alamo building itself. Many other civilians / soldiers / defenders who were killed in other places around San Antonio during the 13 days of battle were not buried at all." I have heard about a lot of the activities that go on in and around this city and the Alamo. What a lot of the visitors do not know is that the front of the building that everyone sees use to be inside the main court yard So if you are standing in front of the main entrance then you are really standing near the center of the court yard where a lot of fighting and dying went on. Thanks Ceaser. I think I need to go pay a visit to that place again. It has been a while. When I was little Davy Crockett was my favorite story of folklore. My dad is a history teacher, so I had some strange favorite stories as a kid, ha ha. j/k. I've always been intrigued by The Alamo, probably because there is so much mystery sourrounding the place and the events. I've always felt a strong connection with the story, so strong in fact that every movie I've tried to watch on it, I have to leave the room when the battle scenes begin. I'd love to visit The Alamo someday, I'm afraid however that I'd be overcome with sadness while visiting. The Alamo and Gettysburg are just two of many places in the US that I'd have that problem with. Anyway, thanks for sharing the info. I might be going to San Antonio for Spring Break. Hopefully, my parents and I will be going to see the Alamo. I'll take some pictures and see if I find anything. Maybe interview some tour guides and workers about their paranormal experiences. If you are driving, or find a tourist info center, there is a pamphlet that lists a ghost tour of the Alamo and the surrounding buildings. The one we took was really good. The guide had some different investigative equipment and he demonstrated how to use it. We got to use it too. Was the tour at night? I wanted to take a ghost tour in New Orleans, but instead I had to see plantations. I would love to take a ghost tour of the Alamo. Munbby, did you see anything on the tour? It was at night. I didn't see anything, but I also did not take my camera with me. This last time when I was back home, my mom and I went to the Riverwalk and this time, I had my camera. From the tour, I knew where to try and cap some photos. Unfortuately, my camera is still back home, as soon as she finishes off the roll, she'll get it developed for me. Been to The Alamo many times. Never had a paranormal experience. But who am I to say that there aren't hauntings. My fiance said that he felt so presence when I took him last year. Hey, y'all! Just got back from San Antonio on Saturday. I went on a ghost hunt (with my mom ) hosted by Alamo City Paranormal. We actually got something! We got a cold spot in the area where the man in the black duster and cowboy hat has appeared. The temperature dropped from 57 to 34! BTW: the story about Ozzy and the "666" is true. For those who don't know the story, here you go! See if you can find the "666" on this picture! Edited by ghosthunter182003, 21 March 2005 - 07:05 AM. No, I didn't take any pictures, but thanks for reminding me, although you're a bit late on the reminder. Don't worry, Caesar...I don't blame you...I blame myself because I didn't have the right kind of camera. I promise that I won't make that mistake ever again. At least I'll try not to make the same mistake again. The circled area is where we found the cold spot. That's the area where the man in the black duster and cowboy hat appears. The arrow is pointing to the spot where historians believe Davy Crockett died. Of course, there is some speculation on that theory. Edited by ghosthunter182003, 22 March 2005 - 10:39 AM. 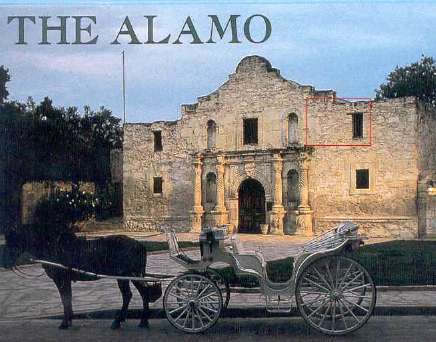 When I was a young girl, in '69 and until '71, I went to the Alamo pretty regularly, about 6 times in all (I lived in Laredo and my uncle lived in S.A.). I remember - I don't care what time of the year you went, that place was always cold. I'm trying to remember if it was air conditioned back then - I guess it would have to be checked with the caretakers. But it was an eerie beautiful, sad place - you were so concious of all the lost human life. There was a plaque on the floor were four uknown soldiers had died, and there were weapons behind glass that you could look at. Another bloody piece of history of the USA. Also, what a breathtakingly rotten and disrespectful thing for Mr. Osborne to do. I am sure he is ashamed of it now, now that he is sober. Thanks for posting those pics, ghosthunter182003.